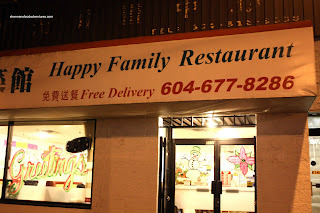 On our way to Pho Hoa a few months ago after hockey, we noticed a Chinese restaurant open quite late nearby. In fact, it was Boss Woman who spotted it and she was lobbying to try it rather than going for pho. You see, she doesn't like pho. 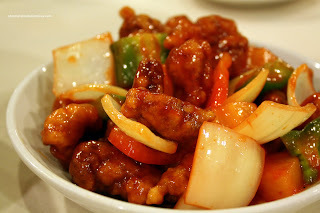 In fact, she doesn't like much at all other than Chinese food. Hey, I hear her. It's cheap, hits the spot and usually open late. However, doing it week after week gets a bit boring. So we filed it away for another time. Well, tonight would be that time. Funny thing is that Boss Woman didn't join us since it was so late. It always appears that she seems to miss the times we actually go to a Chines e restaurant. Milhouse has another theory - we do it to spite her. Nice. Now let's hope she's not reading this! So we head over to Happy Family at the really early time of 1:30am. Fortunately for us, the place is open until 3:00am. In addition to their regular menu, they had "da lang", which is essentially Chinese late night consisting of smaller dishes served with plain congee. Despite the presence of Milhouse and Polka King, who are Chinese as well, I had to do the ordering. Apparently, I'm the most Chinese of all, knowing how to order... Probably the one dish we had to get was the Fried Silverfish. No no, don't worry, it's not the little buggers scurrying around in your kitchen (or a Chinese kitchen...). 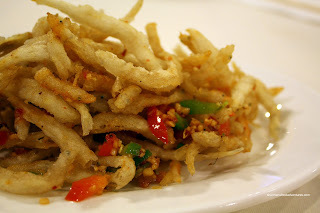 Rather, they are small little fish that are lightly battered, fried and then wok-tossed in chili-salt. They are especially good mixed into the plain congee! The ones here were a bit larger than the usual and were quite flavourful from the chili, pepper and garlic. 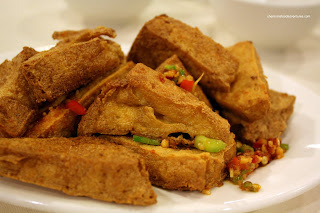 We also got something that had the exact flavour profile (since it's tossed in the same spice mix), the Fried Tofu. These were alright, although fried a bit too long. Bear finally came out of his Winter hibernation and joined us as well. He, being the short rib king, naturally ordered the Black Pepper Short Ribs. Greasy, peppery and plentiful, these were pretty decent. 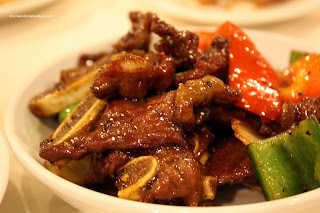 Not as tender as in the Korean-prepared version, the short ribs were still decently moist. I just wished that the whole thing wasn't glistening like a teenage boys' forehead. Milhouse went for his favourite Chinese dish, the Sweet & Sour Pork. Let's see, he can't speak the language and loves S&S Pork, is he really Chinese??? It was actually quite good. Too bad that every other piece was pure fat. Not the most appetizing thing when you bite into it. For some inexplicable reason, Polka King got the Curry Chicken. We were not sure how you would eat that with congee... Ultimately, we had to order a bowl of rice. 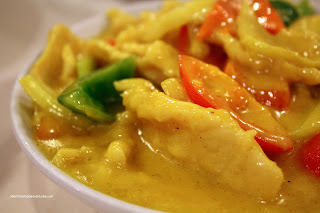 It was alright, your typical Chinese version of curry which is not spicy, very yellow and mostly sweet. For me at least, I found it a bit bland (since I like it spicy). I did like the tender pieces of chicken; although, the texture was indicative of baking soda marination. The food was pretty much on the good side of average here and that's not really a bad thing. The reason? If you can get half-decent food early in the morning hours, it's all that you can ask for really. I know service at Chinese restaurant is generally a crap-shoot under normal circumstances, let alone the early hours. However, we found that the staff were more interested in socializing with friends or regular customers than actually trying to provide any service whatsoever. Getting tea or the bill took forever (at least they were friendly). This begs the question: Would I eat here at regular hours? Probably not; but I would return if it was early in the morning and not much else was open.